This is a recipe that came from my friend, Kelly. My husband loves anything raspberry, something he comes by naturally because his Aunt Anna loves anything raspberry too. 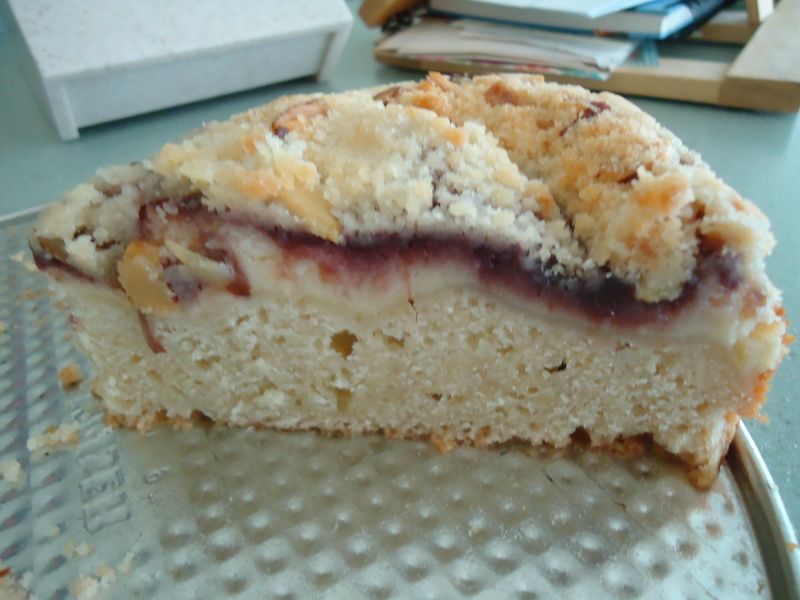 Both of them love this raspberry cream cheese coffee cake. It’s easy to make, delicious and, if it lasts that long, will keep on your counter a couple of days. (It never makes it that long in our house!) It’s perfect for entertaining. I recently made it for my brother’s visit and my sister-in-law is coming this weekend and I’m making it again. It doesn’t get old. (Hubby has asked for it AGAIN!) To mix it up a bit you could use strawberry jam but we love the raspberry. You could also use almond extract in place of vanilla if you like more almond flavor. This would be perfect on a brunch buffet too! Heat oven to 350 degrees F. Grease and flour bottom and sides of 9-inch springform pan. In large bowl, combine flour and 3/4 cup sugar. Mix well. With pastry blender cut in butter until mixture resembles coarse crumbs. Reserve 1 cup of crumb mixture. To remaining crumb mixture, add baking powder, baking soda, salt, sour cream, vanilla extract and 1 egg; blend well. Spread batter over bottom and 2 inches up sides of greased and floured pan. In small bowl, combine cream cheese, 1/4 cup sugar and 1 egg; blend well. Pour into batter-lined pan. Carefully spoon preserves evenly over cream cheese mixture. In another small bowl, combine reserved crumb mixture and sliced almonds. Sprinkle over preserves. Bake at 350 degrees F. for 45 to 55 minutes or until cream cheese filling is set and crust is deep golden brown. Cool 15 minutes; remove sides of pan. Serve warm or cool. Store in refrigerator. This entry was posted in Breakfast, Company Worthy, Entertaining and tagged almond, Breakfast, brunch, coffee, coffee cake, cream cheese, raspberry. Bookmark the permalink.